The use of LED grow lights to provide specific light wavelengths could allow growers to increase nutritional values of edible crops, enhance the intensity of foliage and flower color and improve the postharvest longevity of ornamental and edible crops. 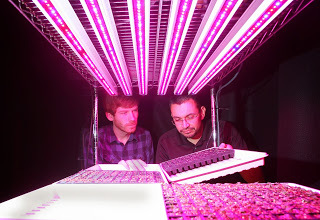 intensities of LEDs allowed researchers to study the direct effects of narrow wave bands of light on plant physiology. Kopsell and his colleagues at the University of Tennessee are studying the impact individual types of light can have on the nutritional qualities of edible crops. Their work is focusing on crops that can be produced relatively quickly in 25-35 days, including microgreens and baby greens. They have also begun looking at some herbal crops including basil, tarragon and chives. 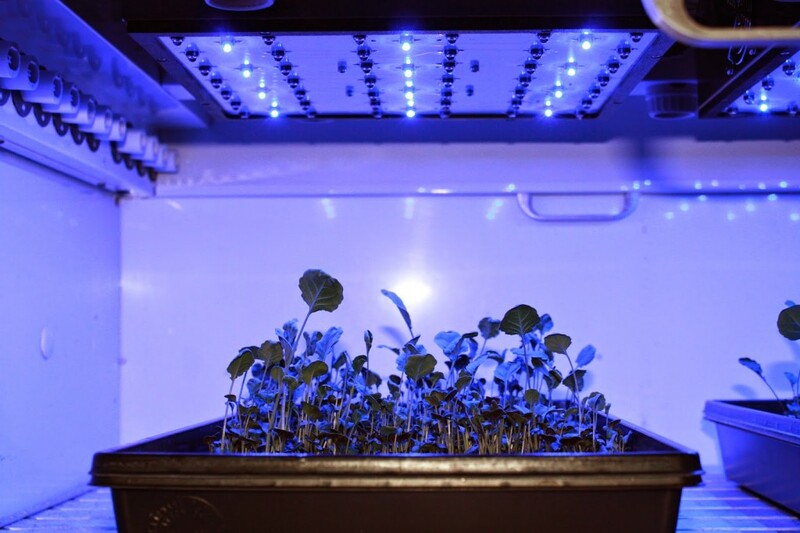 Researchers at the University of Tennessee are finding that exposing plants like brassicas to blue light is having a significant effect on their nutritional values. Photos courtesy of Dean Kopsell, Univ. 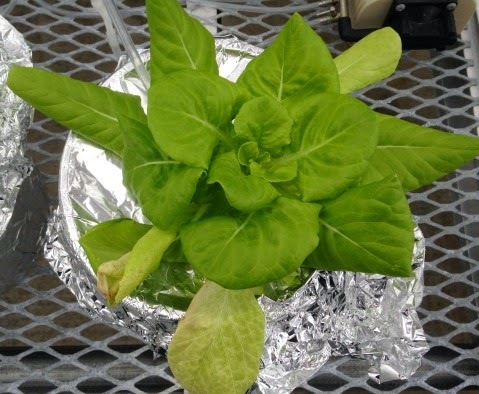 of Tenn.
University of Tennessee researchers have found that exposing plants to narrow wavelengths of the light spectrum has resulted in the increased production of antioxidants and anti-carcinogenic compounds within the plants. “What is even more interesting is some of the primary metabolites like the mineral nutrients are also increasing,” Kopsell said. “We are shifting the light ratios and putting more blue light into the mix. Blue light is close to the ultraviolet (UV) range and has higher energy values than red light. Because of the higher energy level associated with blue light, the more blue light we are exposing the plants to, it seems the more significant the results are on nutritional values. Although researchers have only recently begun to study the impact of narrow light wavelengths on plant physiology, Kopsell said this will be the major use of LEDs in future applications. Kopsell said research exposing leafy brassicas to blue light prior to harvest has intensified pigments and green leaf color. Kopsell said whether plants are grown outdoors, in a greenhouse or in a closed controlled environment with artificial light, the plants are using specific wavelengths from the available light source. “Horticulture, floriculture and agronomic researchers know how much light is needed in order to produce crops with broad spectrum light,” he said. “The million dollar question that hasn’t been answered is how much light is needed from LEDs to achieve that same level of production? It is going to be less than the daily light integral (DLI) from a broad spectrum light source. But, right now we can’t tell you how much less it’s going to be. One of the reasons that plants will not require as much light from LEDs is because of the reduction in light stresses. 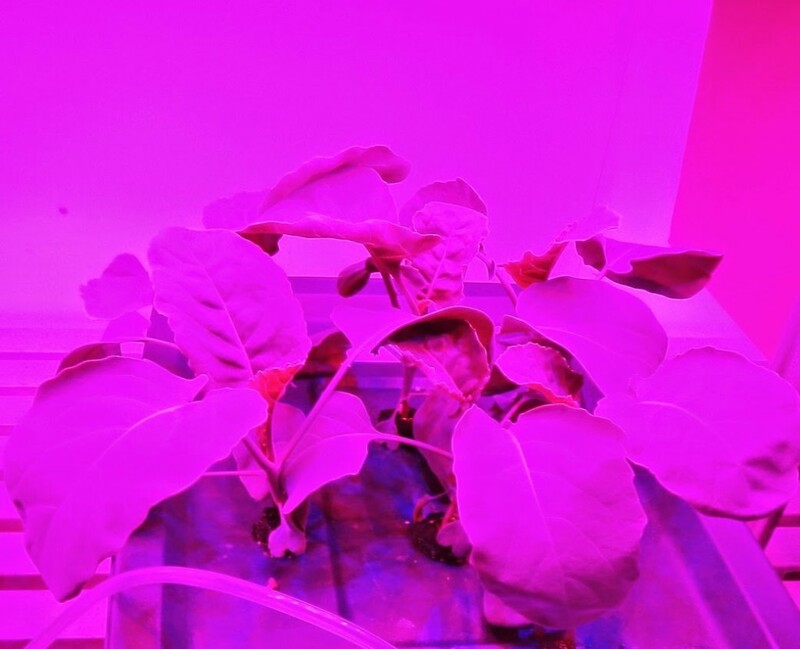 University of Tennessee studies have shown LED grow lights provide a less stressful light environment for plants. For more: Dean Kopsell, University of Tennessee, Plant Sciences Department, Institute of Agriculture, Knoxville, TN 37996-4561; (865) 974-1145; dkopsell@utk.edu. have positive effects on both ornamentals and leafy vegetables. they would if they were grown outdoors. production was also dramatic for purple fountain grass. 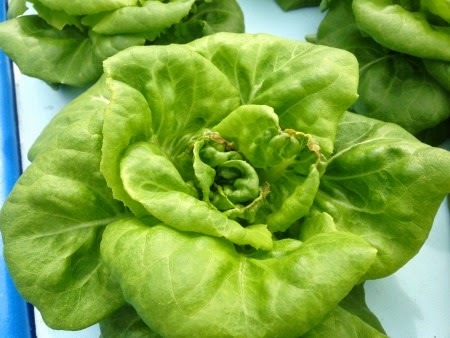 research to red leaf lettuce to see if they could produce a similar response. used for purple fountain grass and the plants colored up in three to five days. LEDs, they exhibited the most intense color. qualities and three different DLIs (light quantity). moles of light, they were much taller than if they received 18 moles of light. contain all of the wavelength colors. perceived by the plants over the course of a day. made later in the day, growers may be overestimating the light level. “The sun produces a broad spectrum of light,” he said. that is visible to the human eye, this includes wavelengths outside of PAR. light that is going to impact how a greenhouse crop is going to grow. are not going to change throughout the day. level isn’t the best way to describe the total amount of PAR light available. measurements which can then be integrated into a cumulative total for the day. 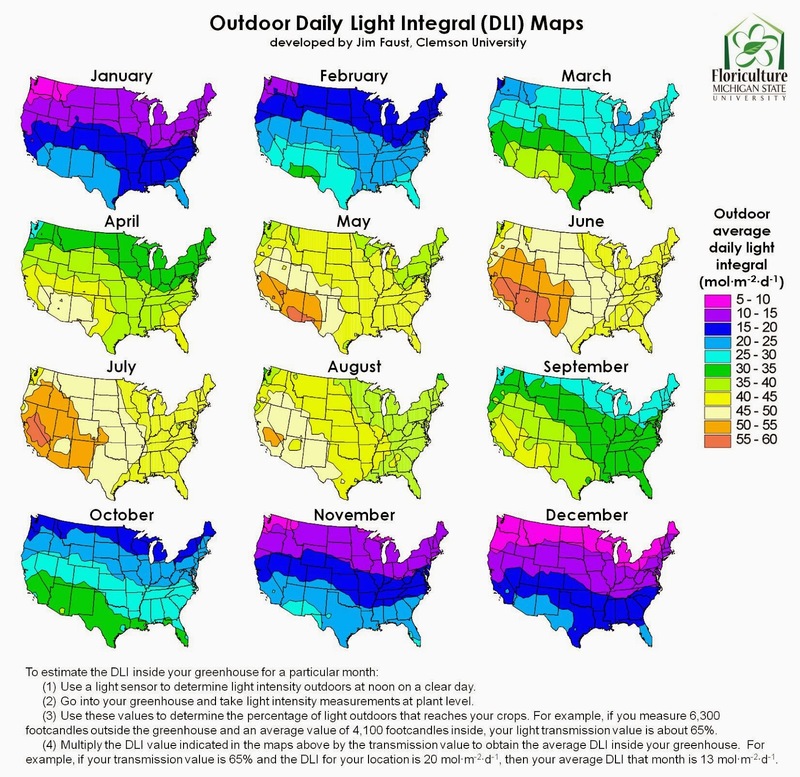 monthly DLI maps for the United States. maps are based on historical averages. Currey said the maps are based on historical averages. “The DLI maps give you a good average,” he said. they will have bright, sunny Novembers and other years, it’s dark and cloudy. DLI necessary for specific crops. with optimum photosynthetically active radiation levels. “It is kind of like predictive lighting,” he said. Currey, Iowa State University, Department of Horticulture; (515) 294-1917; ccurrey@iastate.edu. 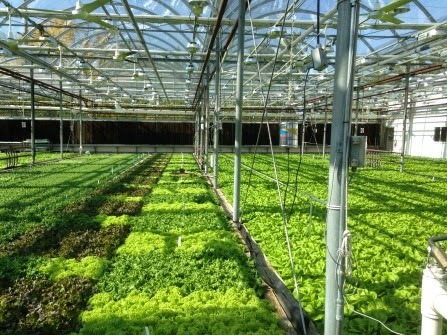 Introduction: Of all the environmental variables in controlled environment agriculture (CEA), light is quite possibly the least controlled and most confusing. Yet, light is such an important factor. Aside from temperature, light is arguably the most important environmental factor which affects plant growth. Light is what drives photosynthesis (the conversion of light energy to chemical energy), photomorphogenesis (the light-driven plant development processes), and photoperiodism (plant recognition of daylength). So what is light? 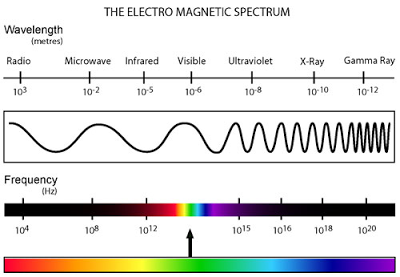 What we so commonly refer to as light is really a small segment of radiation within the overall electromagnetic spectrum (Fig. 1). Electromagnetic radiation is measured in nanometers (one billionth of a meter, 1 x 10-9 meters, or 0.000000001 meters). One human hair is approximately 50,000 nm in diameter. There are three basic types of “light”: radiometric, photometric, and quantum. Radiometric is based on radiant energy or Joules (J) and the passage of that energy is a Joule per second (J·s-1). One J·s-1 is equal to one Watt (W). The rate at which surfaces intercept energy is expressed at W·m­2. Radiometric measurements are inappropriate for plant growth as they often measure light below and above that which plants use. However, that is not to state that they are useless. These units are very important when dealing with the energy balance of a plant or greenhouse system. Photometric measurement is based on how the human eye perceives light. In the U.S., the footcandle (fc) is the preferred photometric unit. Elsewhere in the world the most common photometric measurement unit is the lux (lumens·m-2). However, growers need to understand the limitations of photometric units. Again, photometric units are based on how the human eye perceives light, which at a maximum is approximately 560 nm (or green light) and a waveband that is not correlated with plant photosynthesis. Photometric measurements can be used to determine maximum light in a greenhouse and to determine light transmission (%) outside versus inside. Furthermore, photometric units are instantaneous and do not accurately represent the amount of light that a plant has received over a 24-hr period. Quantum measurements are based on the number of photons (light particles) within a defined waveband (400 nm to 700 nm). This defined waveband is known as photosynthetically active radiation or PAR. Photosynthetic photon flux density (PPFD) quantifies (in micromoles, µmol) the number of photons of light used for photosynthesis falling on a square meter per second (µmol·m-2·s-1, see Fig. 2). So, PAR is the range, PPFD is the measurement. However, most people simply refer to the measurement as PAR. A µmol is 1×10-6 (or one millionth) mole. One mole is Avogadro’s number, 6.02×1023 particles. If marbles were placed end to end over the surface of the Earth, one mole of marbles would represent a layer of marbles 50 miles deep! Unlike radiometric and photometric measurements, quantum measurements are directly correlated to photosynthesis and plant production. Furthermore, quantum measurements can be both instantaneous and accumulated (daily). This is great because plants are really light counters. You can think of a plant’s leaves as nature’s solar panels. Therefore, it is better to know how much light is received by a plant over a 24-hr period versus taking an instantaneous measurement. However, if you must take an instantaneous measurement to get an understanding of your maximum available light it is recommended to do so between 1100 to 1300 hr. If you wanted to quickly measure rainfall over a 24-hr period you could set a rain gauge outside for 5 or 10 minutes and calculate the estimated rainfall. Of course you are presuming that the volume of water falling in the gauge is uniform. Is it? How about light? Does the sun simply turn on and off and project a uniform amount of light over the course of a 24-hr period? Of course not, so why not measure light constantly over a 24-hr period? The cost of light measurement equipment may be one reason not to do so. However, there are companies which offer affordable light measurement technology. Light measurements can provide valuable information. The accumulated light a plant receives is correlated to plant quality and yield. Are you familiar with Daily Light Integral (DLI)? DLI is the light intensity and duration of PAR received each day and is expressed as mol·m-2·d-1 or mol·d-1. DLI is directly correlated to plant growth, development, yield, and overall quality. Attributes of ornamental crops grown under optimal DLI are smaller and thicker leaves, shorter internodes, higher root mass, higher branching and flowers. This should not be surprising. Higher DLI is a common reason why plants finished in late spring generally are of higher quality than those produced earlier in the production season. This is not to diminish the impact of temperature, which is another discussion. 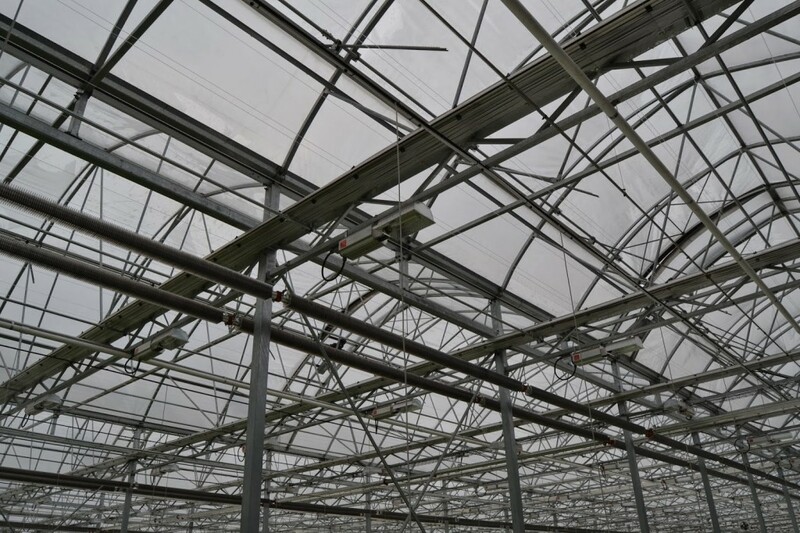 Low DLI can be an indication that the greenhouse glazing needs to be cleaned or replaced; shade cloth needs to be removed or stowed; hanging basket density is too high; and/or supplemental lighting is needed. The average target DLI for propagation of cuttings is 4 to 5 mol·d-1. For bedding plants, containerized crops, and perennials the optimal DLI should be between 10 to 12 mol·d-1. For food crops, a good rule of thumb is >12 mol·d-1. For greenhouse tomatoes, it has been shown that for every 1% increase in light there was a subsequent 1% increase in yield. For lettuce, 17 mol·d-1 is optimal. So what is your DLI? Your first step in DLI measurement can be to familiarize yourself with estimated outside DLI. 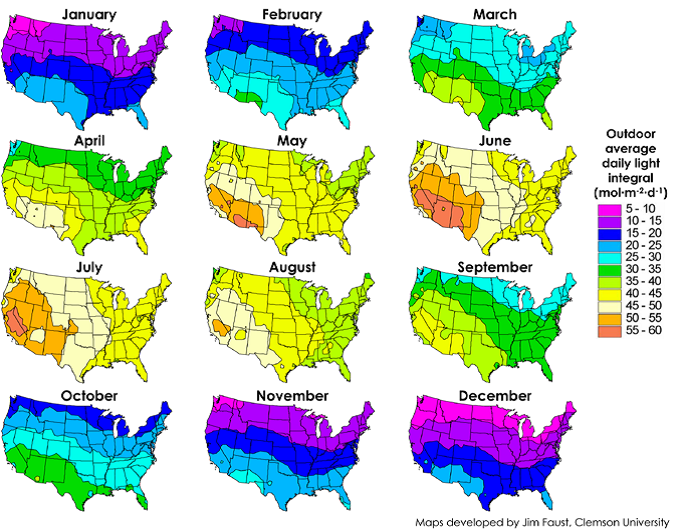 Dr. Jim Faust at Clemson University has developed DLI maps by month across the United States (Fig. 3). However, keep in mind that average transmission loss in any given greenhouse can range from 40% to 70%. Therefore, the next step is to begin measuring DLI. While several companies offer light measurement tools for instantaneous light measurement (more photometric than quantum), only a few offer tools that will measure and calculate DLI. Nevertheless, these tools are quite affordable. A grower can begin measuring DLI for as little as $200. More sophisticated sensors and data loggers range from $500 to $1,000 and up. Summary: Visible radiation, i.e. light, is one of the least controlled and often most confusing environmental growth factors. Radiometric measurement refers to radiant energy and is practical when measuring the energy balance of a system. Photometric measurement is based on how the human eye perceives light. Photometric measurement is useful when determining maximum light levels and light transmission loss within a greenhouse. Quantum measurement is well-suited for plant growth because it relates to light used for several plant-driven processes including photosynthesis. Quantum measurements can be both instantaneous and accumulated. DLI provides and accurate measurement of PAR over the course of a 24-hr period. Plants grown under optimal DLI are generally of higher quality than plants grown under low DLI. Increasing DLI can be achieved by adding supplemental lighting. Please contact me at jbuck@hortmericas.com with additional comments or questions. Keep growing and make it a great day! Figure 1. The electromagnetic spectrum. The visible spectrum encompasses approximately 380 nm to 780 nm. Photosynthetically active radiation or PAR is 400 nm to 700 nm. Figure 2. 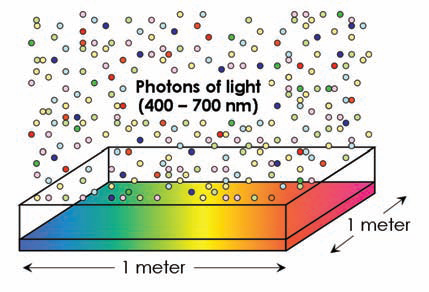 Image depicting photons of light falling on one square meter. Figure 3. 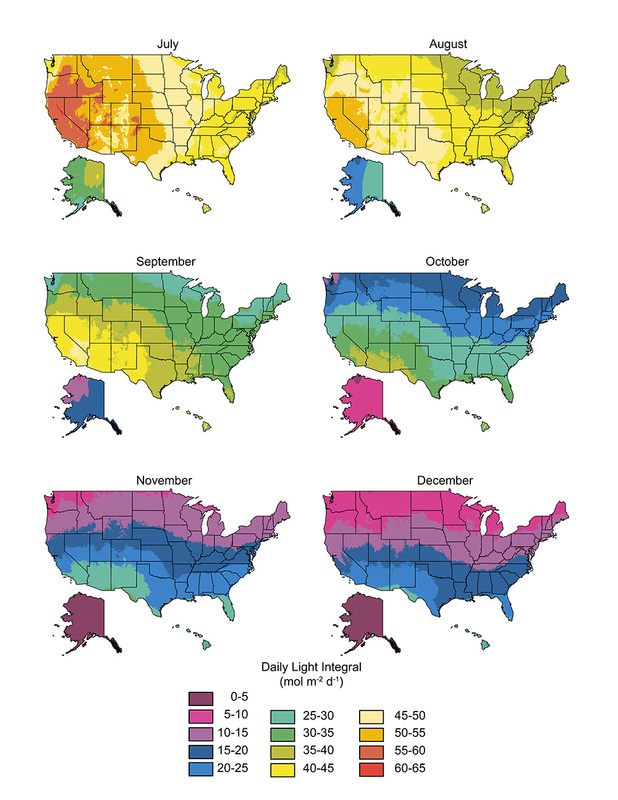 Map of outdoor DLI by month throughout the United States.